Another super easy gluten free, paleo meal. No, white fleshed potatoes are not strictly paleo, but they aren’t strictly NOT paleo either. My general rule is once a month-ish. I was aiming for a nice comfort food type meal so skin-on red potatoes were the way to go (and not very large portions). I LOVE gravy. It borders on bacon level love (but not quite). And what’s not to love? It’s smooth, creamy, meaty flavored but without all the hassle of chewing. Oh right, the flour, the gluten, the MSG, the processed crap in commercial gravies. That. That’s what’s not to love. So… arrowroot to the rescue! (Again!) (( see my quick pork chop fricassee – yum!)) Without further ado, here we go! Sirloin steaks, or any cut you like, cut into 1 inch cubes. Prepare potatoes first, that is start them boiling before you start your beef. Drain them when your beef is done since the gravy will take a bit to set up as the dish cools. Boil potatoes for 20 minutes or until a fork easily pierces the chunk of potato. Drain and return to pot, add butter and chicken stock, and pepper. 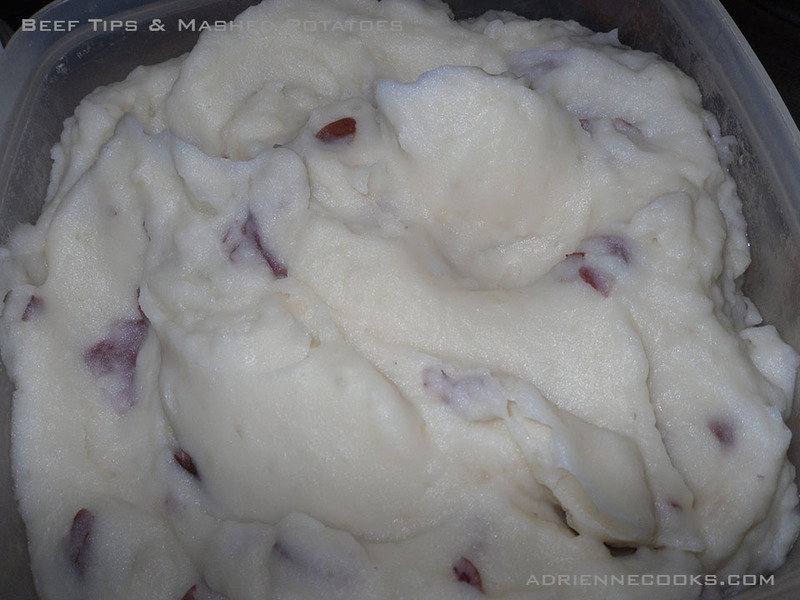 Use a hand mixer to mash and combine. Do a taste test and add salt if necessary. I sometimes add onion or garlic powder for more flavor as well. Heat olive oil in cast iron skillet. 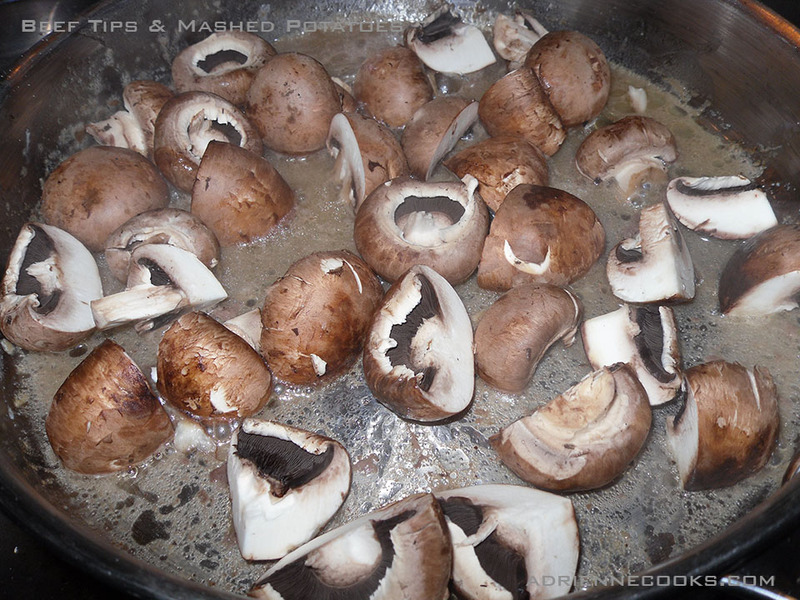 Add steak and sear over medium-high, add mushrooms and reduce heat to medium and add onion and garlic. Cook until onions are translucent and mushrooms are soft. Add beef broth and bring to a simmer. When simmering, add the arrowroot and stir. Do not let the mixture come to a boil. If arrowroot gets too hot it loses its thickening power. 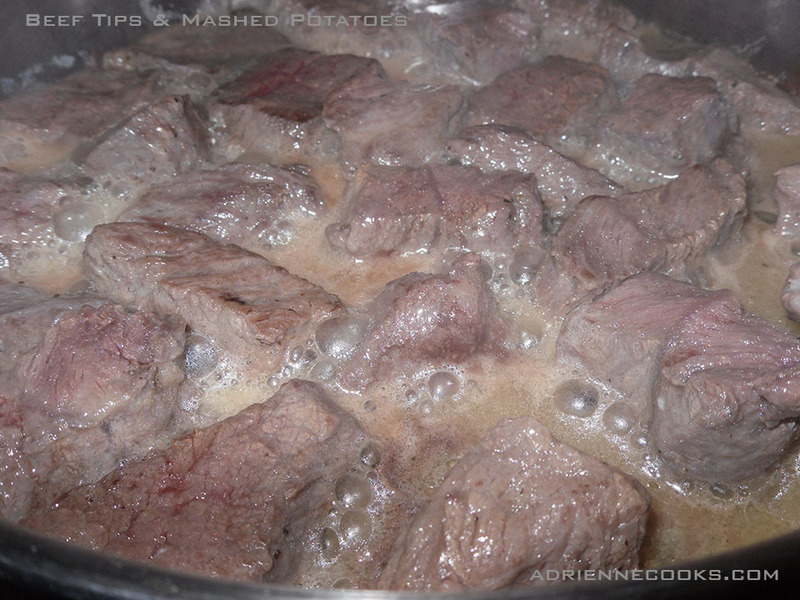 Take your pan off the heat now for medium temp beef or turn down to low and cook 10 minutes for well-done beef. 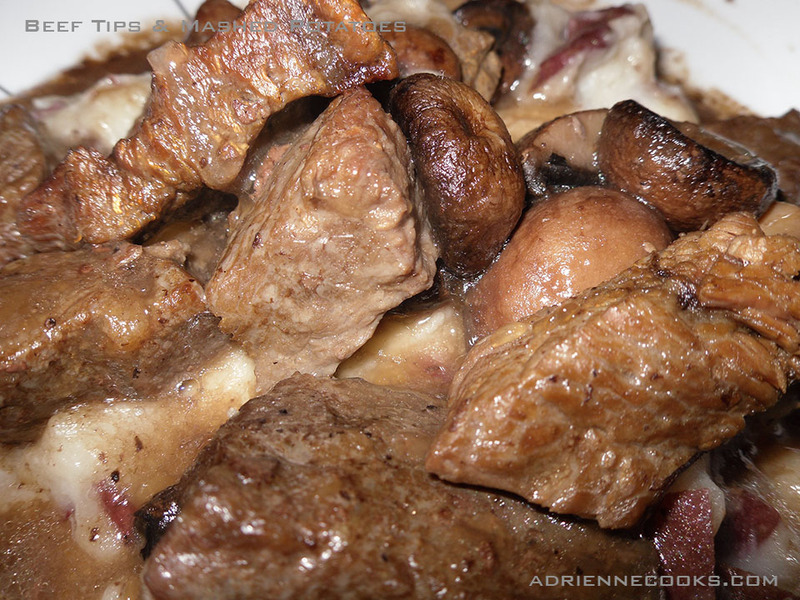 Spoon potatoes onto a plate and cover with beef tips and gravy. The perfect night in, meat and potatoes! If strictly paleo is your thing, you can serve over mashed cauliflower. I swear it’s almost as good. This looks so good… I cannot wait to try it!